When it comes to car advertising there have been brave, inspired and also foolish attempts to grab the attention of potential buyers. However, this latest ‘flash’ ad for the Honda Civic Hatch, on a variety of website portals really takes the cake. First of all, like most countries, there is no adventure out on the highway - there's a plethora of highway patrol cars and sneaky speed cameras, so keep it down or your mailbox will be flooded with speeding tickets. Every single Honda model on sale in Australia is in the doldrums, and the company’s share grew by half of one percent in 2018. One would think it’s time to shake up the ad agency, maybe even threaten to change agencies, because the current theme just isn’t working guys. Honda is a world-class brand, with best-in-class awards across a variety of segments, but really! 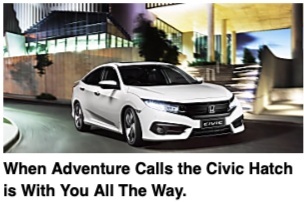 The ad for the Honda Civic Hatch is just downright stupid, and communicates nothing that would lead to a ‘call for action’ – that’s marketing-speak for getting you to at least visit a showroom. In a market like Australia, where 62 separate nameplates are fighting for oxygen, the advertising needs to be bold, innovative and catchy. This ain’t it.